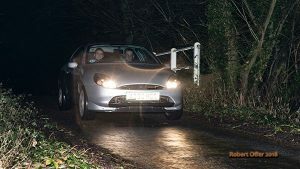 The start of the Club Night and the On Road Championships one again started with Paul and Mathew Smalley’s ‘Stag Night Rally,’ starting from the Stag Public House in West Acre. As is the normal these days with the clubs navigational events, Paul and Mathew had a full entry and a full complement of marshals. Edward and I started at car three. Ahead of us were nine handouts to solve and get on to maps 132 and 144. It always makes it interesting when trying to work more than one map! The first two handouts looked fairly straight forward but right from the start several crews were struggling to get the correct route! The third handout was a circular herringbone showing coloured roads only. Usually this would be quite easy to sort out but with no crossroads for easy reference, this was probably one of the hardest herringbones I have had to crack! I managed to get the correct route on the map and a very twisty and torturous route took us to TC4. The next four handouts were not too bad to sort out but the last one to the finish control was coloured junctions. This was split between the two maps and I struggled to solve it but got there in the end, just getting to the control on time. Edward drove well, and for once I got the route on the maps reasonable quickly. Many thanks to the Marshals who are essential and to Paul and Mathew for a very testing evening! It was also nice to see Bob out taking photo’s. Cheers Bob.